In 1712 in the Hertfordshire village of Walkern, a sixteen year old maid named Anne Thorn fell ill. This was no ordinary sickness however; suffering terrible fits during which she could not speak, the girl writhed and thrashed about until those watching were in tears at the pitiful sight she presented, at a loss for how to help or cure her. Not only that, during her torments Anne Thorn found herself compelled to run to various locations across Walkern and beyond; when on these mysterious missions she was told by an old woman to gather sticks before pinning them into a bundle. With this done, she was to return home to burn them on the fire, and only then could the young woman speak and tell of what had happened. Poor Anne was tormented in this manner for several weeks, her sufferings increasing until there was great fear for her life. The cause? The witchcraft of Jane Wenham, a local widow who had been suspected for several years now of being a witch. 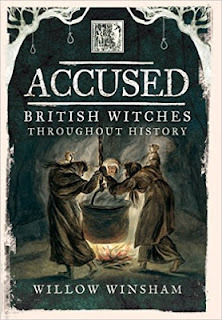 Although the worst excesses of the witch trial period were long passed in England, the belief in witchcraft and the power a witch held were still strong. Just how did the people of Walkern go about attempting to free Anne Thorn from her bewitchment by Jane Wehnham? This was often the first port of call when trying to cure a suspected bewitchment, with varying degrees of success. In Anne's case, prayers had a short term favourable result, and the girl would be free from her fits for a few hours at least. Anne always fell ill again however, sometimes worse than she had been before, and prayer was not considered enough to cure her entirely or break Jane Wenham's spell. Despite the dubious efficacy of this method, the spectacle of a victim being prayed over and 'cured' was a popular one to reinforce the guilt of the suspect, and many were gathered to see Anne Thorn prayed over in the court room during Jane Wenham's trial. Prayer was also believed to be a telling tool in proving the identity of a witch, and it was Jane Wenham's inability to say The Lord's Prayer through without a mistake that further convinced the people of Walkern that she was to blame for Anne's suffering. Fire and witchcraft have always been strongly associated with each other, no more so than in the erroneous assumption that English witches were sent to the flames rather than the gallows. Anne's employer, Mrs Gardiner the vicar's wife, was adamant that the bundle of sticks Anne had gathered should be thrown onto the fire; this served a two-fold purpose, as the intent was to break the spell of the witch but also to reveal her identity. In this case it seemed to work, as Jane Wenham appeared at the doorway not long after. When later in the story a suspicious bundle of feathers were found in Anne's pillow, Mr Bragge, who wanted to keep them for evidence, was over ruled by the majority of those present who insisted that this dangerous artefact must be burned immediately to avoid any further harm to the girl. The tried and tested method of 'scratching' a witch was threatened and carried out several times in an attempt to break the hold Jane was believed to have over Anne. On one occasion, Anne felt so compelled to do so that, despite recovering from a recently dislocated knee, she dragged herself from her bed all the way to Jane's house. Despite being unsuccessful in drawing blood from Jane, the following day the old woman was brought before Anne: the girl attacked her, scratching her forehead violently. Despite the ferocity of the attack however, there was very little in the way of blood that appeared, a sure sign that Jane was the guilty party, as witches were known not to bleed. This scratching did little to help Anne and her symptoms continued as before, and the girl made several further attempts to scratch the old woman. At a later point, a pin or needle was also inserted into Jane Wenham's arm: it was reported that instead of blood, only a watery serum appeared, yet another proof that she was a witch. One way of protecting yourself from witchcraft was to make a 'witch bottle'; urine from the purported victim, along with other items such as hair and nail clippings and iron nails were placed in a stoneware vessel that was then concealed. A variation on this practice was used by those attempting to cure Anne Thorn and prove Jane Wenham's guilt; Anne's urine was placed in corked stone bottle and heated over the fire. As the bottle was heated, Jane was observed to be in great pain and distress, only for her to be fine once more once the bottle exploded. When all else failed, a white witch or cunning man/woman was finally consulted regarding Anne Thorn's pitiful state. The suggested remedy was a simple one: the girl was to wash her hands and face each day in water that was specially prepared for the purpose. Perhaps most tellingly, Anne was also to be attended by 'a young lusty man' during this time. Whether the water or the companion were to thank is unclear, but Anne went on to make a full recovery at last from her sickness and and was married – very likely to that same lusty young fellow – not long after. Read more about Jane Wenham and more accused witches from across the British Isles in Accused: British Witches Throughout History by Willow Winsham. Willow Winsham brings readers regular tales of witches and witchcraft at her blog, The Witch, the Weird and the Wonderful. Combining a passion for research and history with a love of storytelling, she dedicates her time to investigating some of the most intriguing stories from the history of the British Isles. She is a Twitter co-host for #FolkloreThursday and her work has featured in All About History. When she isn't digging out tantalising historical titbits or tracing elusive family members, she is busy home educating her two children. Written content of this post copyright © Willow Winsham, 2016. Fascinating, thank you! I knew that witches were not burned in England [one of the things that irritated me in Harry Potter, I have to say] though as heretics were burned, and witchcraft was heresy I suppose that this could be where the confusion arose. Hi Sarah. glad you enjoyed the post! Yes, the heretic/burning link no doubt confused matters, as did the fact that in Scotland and on the Continent witches *did* go to the flames! there's something very satisfying in the debunking of urban myths, like the one about Josephine Bonaparte collecting roses and even the Royal Navy letting rose ships through for her. Not one gardener who visited and wrote about her gardens at the time mentioned roses.